Ok, so why is it that in 1988 we can make cars that get 58mpg (1988 Chevrolet Sprint Metro) with a regular internal combustion engine and here we are almost 20 years later getting WORSE mileage with special Hybrid engines? Check out the federal fuel economy page for proof. I'll tell you why. People want performance, not gas mileage. And the automakers are certainly willing to give the selfish ME ME ME generation what they want. In 1984 Honda made a 1.3 liter Civic that pumped out 60 horsepower and a whooping 67mpg on the highway (Edmunds). 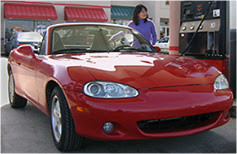 Now in 2006 they squeeze only a mere 50mpg from the 1.3 liter hybrid at 110 horsepower (Edmunds). Just imagine what they could do if the focus was on MPG and not HP. Of course one of the big selling factors with the new hybrid technology is the environment. If you do a side by side comparison using the federal fuel economy page you will see that the 1.5 liter 1985 Civic, while getting an overall better mileage rating than the 1.3 liter 2006 Civic hybrid, puts out LESS annual greenhouse gas emissions. It's clear that the auto makers around the world will make what the public demands. It's time the public started demanding something better for the world and not just thinking of themselves. But I guess since global warming is just a myth and there is plenty of oil to go around we don't really need our vehicles to get better mileage. But if we can get better 0-60 times, now that is what is important.